The CCTV cameras are used for surveillance purpose. It is used for the protection of people, assets and systems. The CCTV cameras are used to support the security systems and also provide the video coverage of security alarms for barriers, intrusion detection and access control. A CCTV system provides the direct linkage of camera with monitor. The various components associated with CCTV cameras includes cameras, lenses and power. The growing advancement in CCTV technologies has led to component miniaturization and automated imaging analysis. The CCTV cameras are enabled with analog or digital transmission of signals. The CCTV cameras involve the components that are used for direct generation, storage and displays of important data. The global CCTV cameras market is witnessing significant growth on the account of increasing security threat. This is anticipated to be major reason for the expansion of the CCTV cameras market during the forecast period. The rising application of CCTV cameras in industrial and government sector on the account of increasing security threats. Additionally, the increasing innovation in the field of CCTV cameras is also major factor for the growth CCTV cameras during the forecast period. On the basis of technology, it is sub-segmented into wireless, analog, hybrid and IP-based. Analog is expected to be the leading sub-segment. The low cost associated with analog cameras is expected to boost the growth of sub-segment during the forecast period. On the basis of application, it is sub-segmented into hospitality, retail, commercial infrastructure, BFSI, government and home security. Commercial infrastructure is expected to be the largest application sub-segment .This is attributed to the high demand from industrial sector in order to protect the commercial property and assets such as inventory, data and files. The growing crime related activities across the globe is a primary driver for the overall market during the forecast period. The rising awareness regarding the benefits of CCTV cameras in commercial sector is also increasing the demand for CCTV cameras. This is expected to drive the CCTV cameras market during the forecast period. The growing technological development in the CCTV cameras drives the overall CCTV cameras market during the forecast period. For instance, the introduction of technologies such as 4K cameras has high pixel resolution which enhances the quality of pictures taken by CCTV cameras. 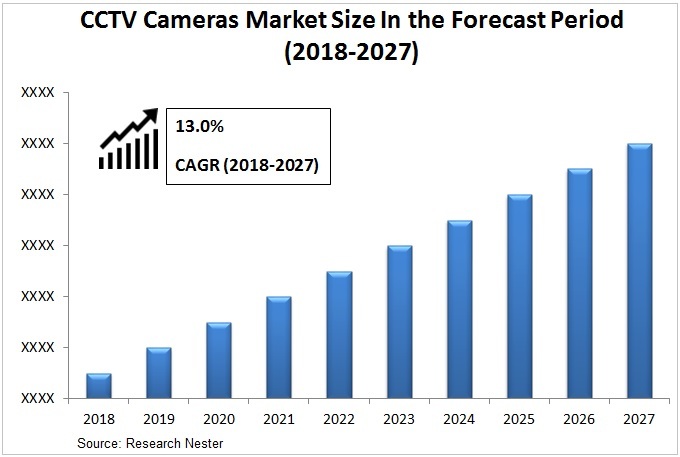 Additionally, the growing adoption of highly advanced technologies is expected to further boost the growth of overall CCTV cameras market during the forecast period. The high maintenance cost associated with CCTV cameras coupled with high initial investment is expected to restrain the growth of overall CCTV cameras market during the forecast period. On the basis of regional analysis, global CCTV cameras market is segmented into five major regions including North America, Europe, Asia Pacific, Latin America and Middle East & Africa region. Asia-Pacific region is expected to be a major region of overall CCTV cameras market during the forecast period. The increasing application of CCTV cameras in government and commercial sector is expected to be primary reason for the increased demand for CCTV cameras. Additionally, the growing commercial sector in the countries such as China and India is also supporting the growth of overall market during the forecast period. North America is expected to showcase substantial growth during the forecast period. The increasing crime related activities in the region is expected to major reason for the substantial growth during the forecast period. For instance, according to United States Federal Bureau of Investigation the total number of crime cases related to property was 3.5 million in 2015 and it grew to 3.8 million in 2016. The growing number of cases in the region is expected to further boost the growth of overall CCTV cameras market during the forecast period.